Operation in auto-active mode, with automatic adaptation to your style of driving as well as to the road profile (Position D). Operation in sequential mode, with manual gear changing (Position M). Operation in automatic SPORT mode (Position D) and press button A. Operation in automatic SNOW mode (Position D) and press button B. The driving mode and the position of the gear lever are displayed in dial C of the instrument panel. The gear lever can only be disengaged from position P if you are pressing the brake pedal. When the driver's door is opened, a beep sounds if the gear lever is not in position P.
Before leaving the vehicle, make absolutely certain that position P is selected. The engine can only be started when the lever is at position P or N.
A safety device ensures that starting is impossible in the other positions. M to change to manual mode. The change from position D (driving in automatic mode) to position M (driving in sequential mode) or vice versa can be made at any time. To avoid any movement of the vehicle when parked, place the gear lever to P.
Do not engage until the vehicle is completely stationary. In this position, the driving wheels are locked. Check that the selector is in the correct position. Securely apply the parking brake. Do not engage until the vehicle is stationary, foot on brake. To avoid gearbox snatching, do not accelerate immediately after the selection. Note: Juddering may be felt when changing from position P to R on a steep gradient. Do not select position N if the vehicle is moving, unless absolutely necessary (vehicle being towed). Do not select position N if the vehicle is moving (except in absolute necessity). Never select positions P or R if the vehicle is not completely stationary. If while the vehicle is moving you inadvertently select position N, leave the engine to idle before engaging position D or M.
In this way the gearbox operates without the need for your intervention. For certain manoeuvres (e.g. overtaking), it is possible to obtain maximum acceleration by pressing hard all the way down on the accelerator pedal, which may trigger automatic changedown to a lower gear. During braking, the gearbox may kick down automatically in order to offer an effective engine brake. If you suddenly lift your foot off the accelerator, the gearbox will guard your safety by not changing up again. Push the lever towards “+” to change up a gear. Pull the lever towards “-” to change down a gear. Note: Passage from one gear to another is only possible when vehicle speed and engine speed permit. The “SPORT” and “SNOW” modes are not available in sequential operation. 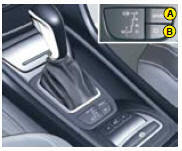 If the engine speed is too high, the gearbox automatically selects a higher gear. If the engine speed is too low, the gearbox automatically selects a lower gear. Press on button A to select the SPORT driving mode. Press on button B to select the SNOW driving mode. Pressing again on button A or B returns you to NORMAL driving mode. SPORT mode is for more responsive driving, to provide maximum performance and acceleration. The instrument panel display lights up. SNOW mode facilitates starting and smooth driving when road adherence conditions are poor. NORMAL mode is selected by default when the engine is started. This driving mode is suitable for normal driving conditions. No warning lamp will light up in the instrument panel. Remark: The driving mode selected before you switched off the engine will be retained the next time you start up. If there is an operating fault, the gearbox is stuck in a gear, do not exceed 100 km/h (approx. 60 mph). Juddering may be felt when selecting R for reverse gear or when returning to position D.
Do not stop your engine if the gear selector lever is in position D or R.